NO, not pixels. Pixels are a minute area of illumination on a display screen, one of many from which an image is composed. 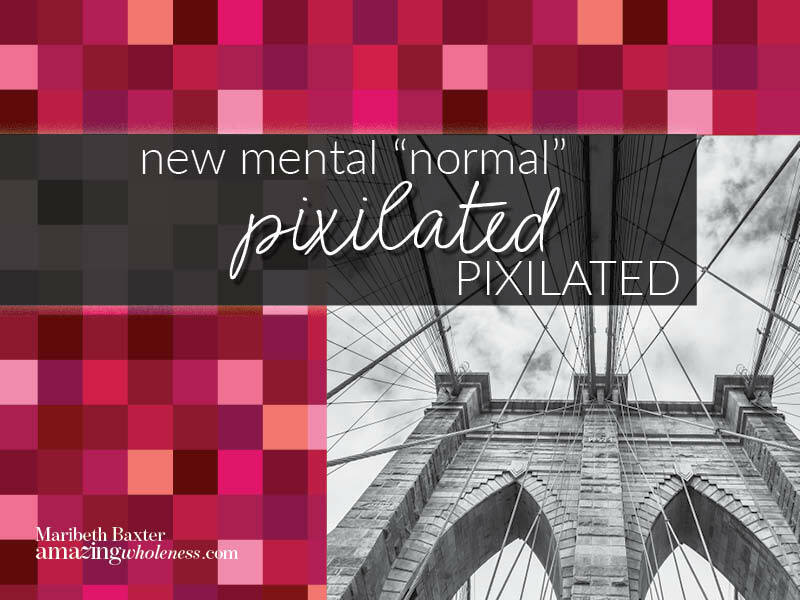 Pixilated is my new favorite word, very different than pixels. Pixilated has a long history, first known use was in 1848. Wish I met the person who came up with this one. It is a super fun word to say, try it. During chronic illness, we go through phases of being ultra-sensitive and then the other end of the spectrum with broken give-a-darns. We have moments of clarity and we have brain dead days. We appear so lazy that we must be mentally ill, yet we couldn’t muster enough energy to walk to the kitchen. Somewhere in these peaks and valleys is the new norm — being pixilated. Words like “crazy” can be devastating to someone who is already knocked down from chronic illness. Sad to say but it is very common to hear when we are ill. Doctors cannot figure out what to do with us, so they resort to calling us crazy. Family and friends don’t have the patience for us so they call us crazy. Others don’t agree or understand our medical choices, therefore WE must be crazy. On and on it goes. That can become traumatizing when we are chronically ill and dealing with all the battles. If that is where you are at, seek help to get support. Chances are, you are not crazy at all, you are just dealing with the complexities of illness that would be overwhelming to anyone. If you want to get a smile out of the crazy vs normal conflict, watch this sweet old movie. It will convince you that you are just as sane as the next guy, maybe even more so. It is actually a comedy. Yet it addresses the “medical” explanation of manic depressives and a pixilated view of it all. I LOVE THIS!!!! Gary Cooper plays Mr. Deeds who is this sweet shy middle-aged man who surprisingly inherits $20 million. Mr. Deeds becomes surrounded by the insanity of others while he sorts out the chaos. Then the insane people try to put him away for… yep, insanity. Mr. Deeds quits talking at this point. Why would he even bother to speak? He has been humiliated, teased, harassed, taken advantage of, tricked, manipulated and no one has tried to listen to a word of his heart. Their “normal” is unfair and unjust. And of course mean spirited. When Mr. Deeds brings light to the meaning of pixilated, he becomes the …… Well, watch the movie before I give it away. New York City is where Mr. Deeds met the chaos and insanity of humanity. He jumps on a fire engine at one point, takes walks through the city streets and flirts in Central Park. Getting lost in fun movies lowers our stress, calms our bodies and leads us down a healing path…. Mr. Deeds was not ill in any way, but he did have to learn how to deal with intense stress in his own unique way. We can learn how to do this too. It will look different for everyone. Hope you are as pixilated as I am! !